Ink Studio墨齋 is pleased to announce its forthcoming exhibition The Phenomenology of Life with works by the eminent ink painter Huang Zhiyang (b. 1965, Taipei, Taiwan). In conjunction with the National Museum of China in Beijing, where Huang's oeuvre will be subject of a solo show with the same name, Ink Studio shows Huang's most recent work. At these two shows, Huang exhibits two new monumental works in his Beijing-Bio series of biomorphic mega-flora/fauna ink paintings. At 4.75 x 12.6 meters, these are the largest two-dimensional compositions he has ever undertaken. Huang also exhibits the latest silk canvases from his Zoon Dreamscape series of pure abstractions in high-gamut mineral pigments and traditional ink as well as the latest series of Op Art-like Three Marks abstractions in which he explores the Deleuzian border between order and chaos, stability and change. Finally, Huang created two installations: at Ink Studio, there is a video room where viewers can contemplate the origins of life in the microbial world — the "Microcosmos" of Lynn Margulis — and at the National Museum of China, Huang installs a massive granite sculpture entitled Dragon Vein from his Possessing Numerous Peaks series. Huang Zhiyang's artwork bridges the holistic and organicistic world of classical Daoism, Buddhism and neo-Confucianism with the emergent and non-linear worlds of contemporary phenomenology, neurology, evolutionary biology and deep ecology. Although best known for his biomorphic ink figures and abstract paintings using high-gamut mineral pigments, Huang's artistic practice also spans sculpture and ecologically focused public installations in bronze, stone, bamboo and other natural materials. Regardless of medium, his work reveals a common "unity of the universe — of humankind, microscopic life forms, plant life, and all other forms of presence" (Britta Erickson). In his native Taiwan, Huang Zhiyang graduated in 1989 from the Taipei Chinese Cultural University with his major in traditional Chinese ink painting. 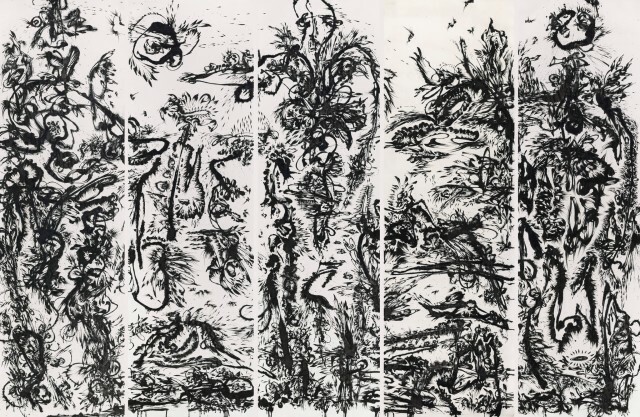 He was at the forefront of several artists who, in the 1980s and 90s, helped to build the Taiwanese contemporary art scene, resulting in his being included in the contemporary ink painting exhibition held at the Taipei Fine Arts Museum (1988). Huang represented Taiwan at the 46th Venice Biennale (1995) and the Museum of Contemporary Art in Sydney (1995) and featured prominently in the Inside/Outshow at the Museum of Modern Art P.S.1 and Asia Society in New York and the Museum of Modern Art and Asian Art Museum in San Francisco (1998). Huang's inclusion in the New York MoMA show was a seminal event in his career and he subsequently exhibited at the National Art Museum of China, Beijing (1999), the National Taiwan Museum of Art (1999), the progressive Tacheles Art Center in Berlin (1999) and the Hong Kong Visual Arts Centre (2000). In 2006, Huang moved to Beijing. He held exhibitions at the Museum of Contemporary Art in Shanghai (2006), the Museum of Contemporary Art in Taipei (2006), and the Museum of Contemporary Art in Beijing (2007). Huang showed for a second time at the 54th Venice Biennale (2011) and was included in the 4th Guangzhou Triennial (2012). During this time, his work was also shown at the Shanghai World Expo (2010), at FIAC (2011), at Art Basel Miami Beach (2011) and at exhibitions organized by the Fédération Française de la Couture (2010 and 2011). Huang's works can be found amongst others in the UBS Art Collection, Switzerland, the Deutsche Bank Collection, Germany, the Barclays Bank Art Collection, Singapore, the collection of the U.S. Department of State's Office of Art in Embassies, USA, and the collections of the Kaohsiung Museum of Fine Arts, Taiwan, Taipei Fine Arts Museum, the Museum of Fine Arts, Taiwan, the Guangdong Museum of Art, Guangzhou, and the National Museum of China, Beijing. Dr. Britta Erickson, Ink Studio's Artistic Director, curates this new show. An independent scholar and curator living in Palo Alto, California, she has curated major exhibitions at the Arthur M. Sackler Gallery, Washington, D.C. (2001-2002) and the Cantor Center for Visual Arts, Stanford (2005). In 2007 she co-curated the Chengdu Biennial, which focused on ink art, and in 2010 she was a contributing curator for Shanghai: Art of the City (Asian Art Museum, San Francisco). Ms. Erickson is on the advisory boards of the Ink Society (Hong Kong) and Three Shadows Photography Art Centre (Beijing), as well as the editorial boards of Yishu: Journal of Contemporary Chinese Art and ART AsiaPacific. In 2006 she was awarded a Fulbright Fellowship to conduct research in Beijing on the Chinese contemporary art market. Dr. Erickson received her Ph.D. in Chinese Art History from Stanford University. As Dr. Pi Li, senior curator at Hong Kong's M+ Museum, recently observed, "several artists in the past 30 years have greatly advanced and enriched ink's modern expression." He calls for a serious study and research of this phenomenon. It is exactly what Ink Studio is devoted to. As with every artist featured at Ink Studio's exhibitions, Huang Zhiyang's work and life will be subject to a scholarly publication edited by Dr. Britta Erickson. The publication will appear circa six months after the closure of the exhibition and will be distributed in the USA by D.A.P.